The concluding night (9/9) of the weekend Creative Arts Emmy Awards saw two notables who recently passed away earn major wins, while joining the exclusive ranks of EGOT honorees were three key contributors to NBC’s production of Jesus Christ Superstar Live In Concert. 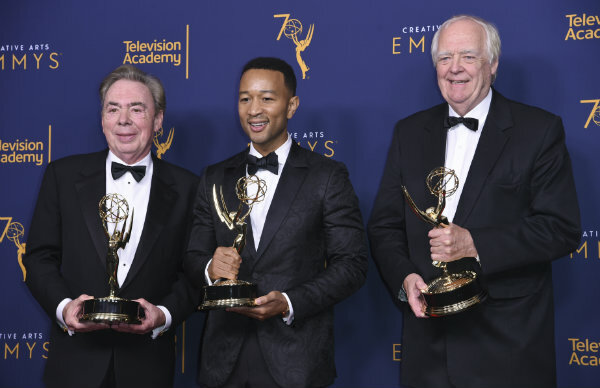 On the latter score, performer John Legend, composer Andrew Lloyd Weber and lyricist Tim Rice joined the elite club of EGOT winners. With the musical earning the Emmy for Best Live Variety Special, EPs Legend, Lloyd Webber and Rice added the TV Academy honor to their Tonys, Grammys and Oscars. The three become the 13th, 14th and 15th artisans to win all four show business awards. Among those previously accomplishing this feat were Audrey Hepburn, Mel Brooks, Rita Moreno, Mike Nichols and Whoppi Goldberg. Meanwhile the dead were honored and remembered during the Creative Arts Emmy proceedings--namely Craig Zadan and Anthony Bourdain. Zadan, who died last month, was an EP on Jesus Christ Superstar Live In Concert, a role which earned him his first career Emmy. Bourdain, who committed suicide back in June, was honored with six Emmys--five for his Anthony Bourdain: Parts Unknown series (CNN) and one for Anthony Bourdain: Explore Parts Unknown (CNN.com), a digital show which topped the Outstanding Short-Form Non-Fiction or Reality category. Bourdain’s CNN series earned distinction for: Outstanding Informational Series; Outstanding Picture Editing For A Nonfiction Program (Hunter Gross, ACE) for the “Lagos” episode; Outstanding Sound Mixing For A Nonfiction Program (Single or Multi-Camera), also for “Lagos” (re-recording mixer Benny Mouthon, CAS); Outstanding Sound Editing For A Nonfiction Program (Single or Multi-Camera) for the “Seattle” episode (sound editors Brian Bracken and Nick Brigden); and Outstanding Writing For A Nonfiction Program on the strength of Bourdain’s penning of the “Southern Italy” episode. Lydia Tenaglia, EP of Anthony Bourdain: Parts Unknown, accepted the writing Emmy for Bourdain. She shared, “Tony was nominated for this Emmy many times, but it had always eluded him. So it is with tremendous bittersweetness that I accept it on his behalf.” Bourdain was a nine-time Best Writing For A Nonfiction Program Emmy nominee. The Zen Diaries of Garry Shandling (HBO)--exec produced by Judd Apatow, among others--earned the Emmy for Outstanding Documentary or Nonfiction Special. Brett Morgen won for Outstanding Directing For Documentary/Nonfiction Program on the basis of his Jane Goodall masterpiece Jane (National Geographic). And winning the juried award for Exceptional Merit In Documentary Filmmaking was Yance Ford’s brilliant Strong Island (Netflix). Tied for the lead with the most Emmy wins after this year’s two-day Creative Arts Emmys were Game Of Thrones (HBO) and Saturday Night Live (NBC) with seven apiece. Next with five Emmy Awards each were Anthony Bourdain: Parts Unknown and Jesus Christ Superstar Live in Concert. Scoring four Emmys apiece were RuPaul’s Drag Race (VH1) and The Assassination Of Gianni Versace: American Crime Story (FX Networks). Coming away with three Emmys each were Atlanta (FX Networks), Last Week Tonight With John Oliver (HBO), Queer Eye (Netflix), The Crown (Netflix), The Handmaid’s Tale (Hulu), The Marvelous Mrs. Maisel (Amazon), the “USS Callister” installment of Black Mirror (Netflix), and Westworld (HBO). On the network scorecard after the Creative Arts Emmys, HBO led the way with 17 wins, followed by Netflix with 16, NBC with 15, CNN with eight, and FX Networks with seven.